NEWARK (APR 13 11) – Lindsey McEvoy of Newark has added another award to her list of accolades. She was recently named the recipient of a Vanguard Student Recognition Award at the Association of Career and Technical Education Administrators Leadership Conference in Albany. She is one of eight students statewide recognized for outstanding performance in a career or technical education program that is non-traditional for a female – Lindsey is studying Power Mechanics/Conservation at the Wayne Technical and Career Center: she is the only young woman in the program. “I feel honored because there aren’t very many females in the career I have chosen,” McEvoy said. And she’s doing well. She maintains an above-90 average and plans to attend Finger Lakes Community College after graduation, studying national resources conservation. She’d like to go to work in forestry management or with the Department of Environmental Conservation. 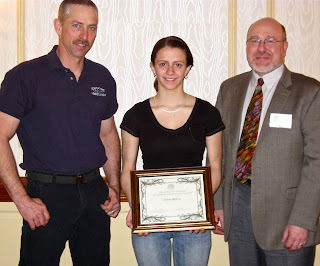 Lindsay was named Finger Lakes Community College and Rochester Channel 8 “Green Student of the Month” in December. 0 Comments to "NEWARK STUDENT RECEIVES VANGUARD AWARD IN ALBANY"